What could be "cooler" than an ice skating birthday party?!?! We have several options available to help make a special day even more special. Fill out the webform below to start your reservation process today! Once you have submitted the webform, you will receive a phone call from our Events Coordinator with available ice times and we will be happy to answer all of your questions. 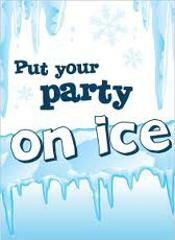 Send an email to Madison Ice Events or call 608-204-7606 for more information. $175 for up to 10 skaters, including skates. Extra skaters $5 each. $100 includes room, skates and admission for up to 10 skaters. Additional wristbands $5 each. Full payment is required at time of confirmation to hold the reservation. If you need to cancel the party for any reason, we will issue a refund of the full amount less a 25% service fee. Payment can be made with cash, a check made out to "Madison Ice Inc" or by credit card over the phone. Bring your own decorations and food! Turn it into a pizza party, sundae bar or just serve cake. Refrigeration not available. Sorry, no glitter, silly string or confetti allowed.